Concept for bus lanes on 14th Street. Image by DDOT. 14th Street in Columbia Heights could get bus lanes, if a proposal from the District Department of Transportation (DDOT) becomes reality. The plans are in the early stages, and agency and neighborhood officials are looking for feedback. 14th Street is one of DC's most important, dense, and rapidly-changing corridors. It's also one of DC's most multimodal streets, with more than 40% of all vehicle trips on the street taking place via bus, and another 3-4% via bike. In Columbia Heights, 14th Street is particularly complicated. Pedestrians come and go via the Metro station, side streets converge and branch off, cars cross over bike lanes to pick up and drop off shoppers, and packed Metrobus and Circulator buses snake through as best they can. Competition is fierce for street space that was never designed for so many diverse users. 14th Street in Columbia Heights today. Image by Google. 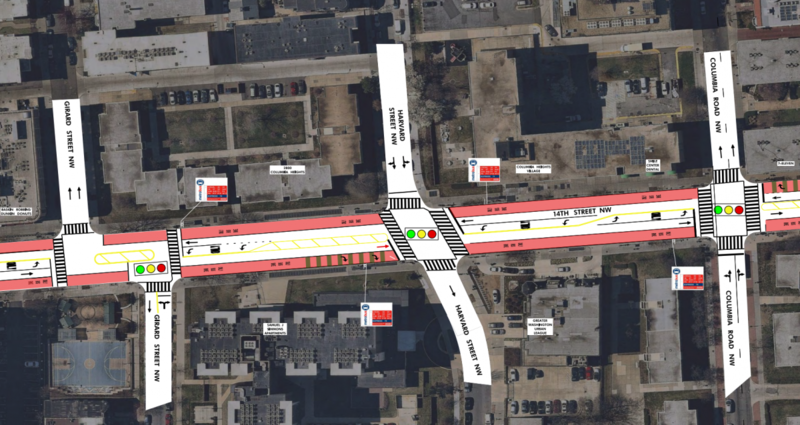 To address 14th Street's Columbia Heights bottleneck, officials from DDOT and the local ANCs 1A & 1B convened a meeting this past June to brainstorm potential fixes, including street design changes. 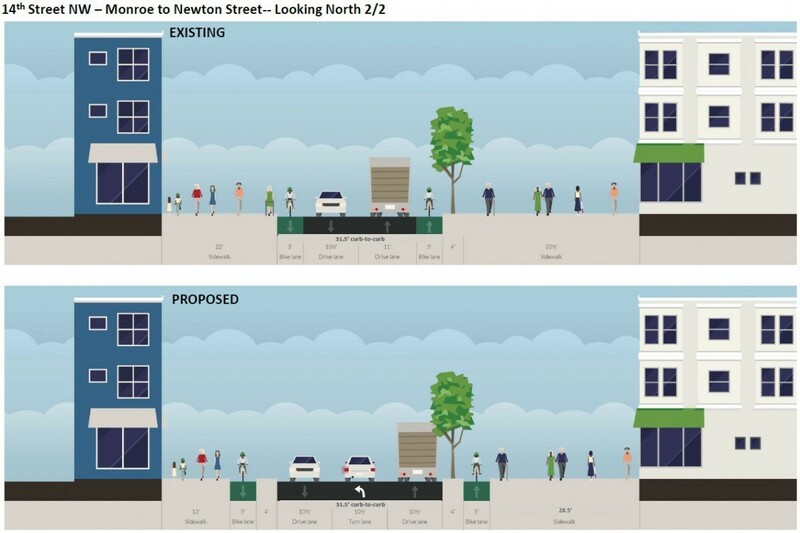 At the meeting, DDOT floated the idea of bus lanes from Euclid Street NW to Newton Street NW. According to the concept, between Euclid Street and Irving Street there would be continuous curbside bus lanes in both directions, operating from 7 am to 10 pm, Monday through Saturday. This will require the removal of some on-street parking. However, with the current proposal drivers would be able to park in the lane overnight and on Sundays. 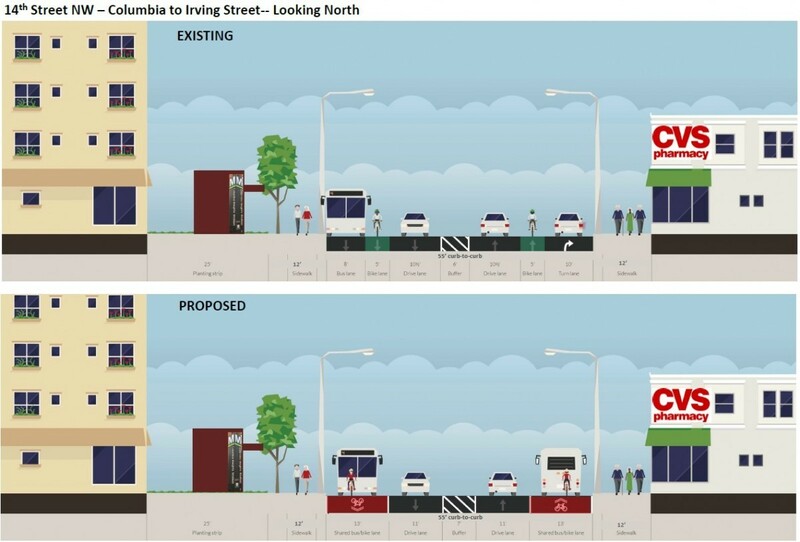 14th Street redesign concept from Irving Street north. Target is in the upper left of the image. North from Irving Street, in front of Target and up as far as the Newton Street fire station, there would be a strategic mix of bus lanes, bike lanes, and pick-up/drop-off zones, according to the specific needs of those blocks. For example, 14th Street's southbound curbside lane directly in front of Target would remain a drop-off zone, but the northbound lane directly across the street would be repurposed from on-street parking to become a bus lane. 14th Street redesign concept from Girard Street to Columbia Road. Image by DDOT. 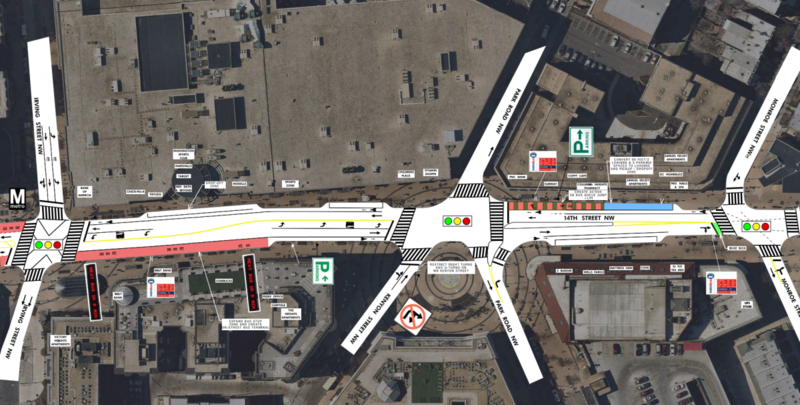 Since the June meeting, DDOT has further developed the concept with cross-sections that illustrate the idea in more detail. 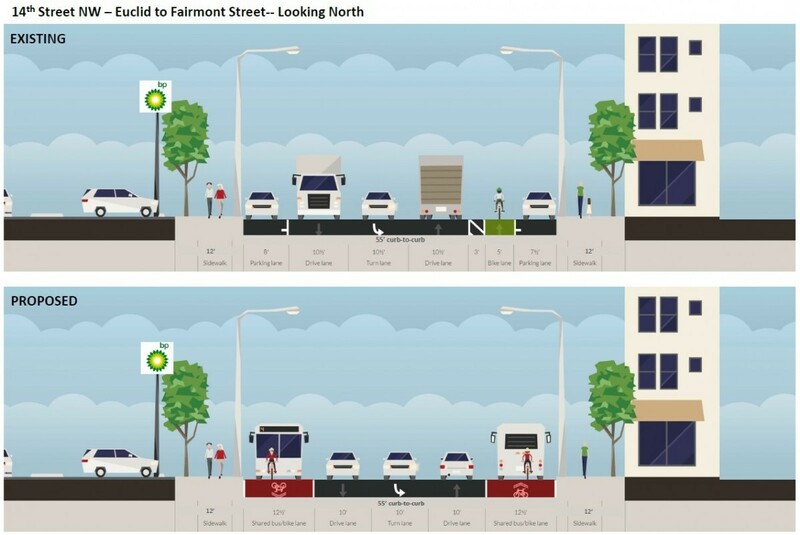 The first three cross-sections, covering individual blocks south of Irving Street, show how today's curbside parking and bike lanes would become bus-and-bike lanes, with slightly different details on each block. Euclid to Fairmount. Image by DDOT. Girard to Harvard. Image by DDOT. Columbia to Irving. Image by DDOT. The fourth cross-section shows 14th Street immediately north of Irving Street. 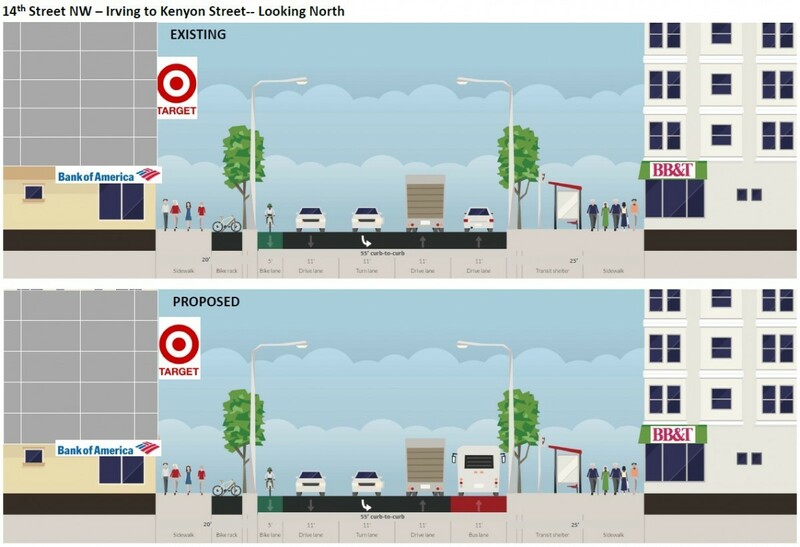 The pick-up/drop-off lane immediately in front of Target is further north, not visible in this drawing but still present in the redesign concept. Irving to Kenyon. Image by DDOT. 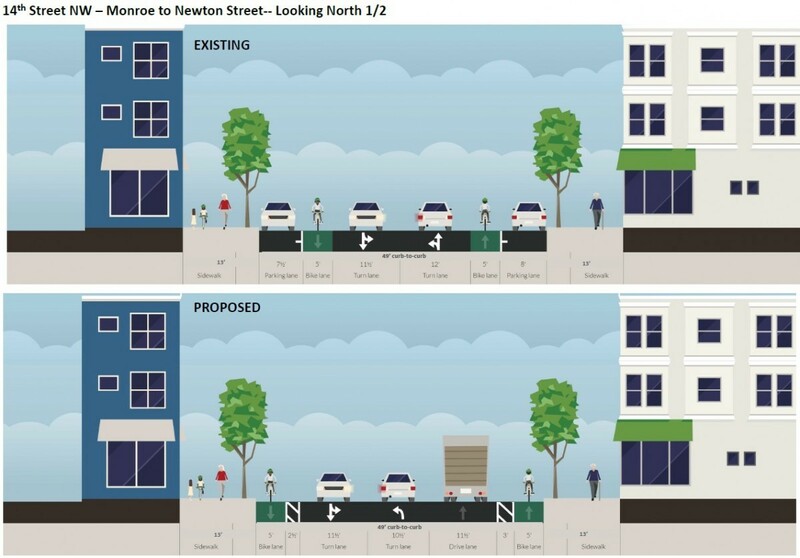 The fwo final cross-sections show alternate concepts for the block between Monroe and Newton, where DDOT is proposing either street-level or sidewalk-level protected bikeways. Monroe to Newton, option 1. Image by DDOT. Monroe to Newton, option 2. Image by DDOT. Neighbors are evaluating these plans. Next steps will come early in 2019. Following the meeting this past June, ANC commissioners from Columbia Heights asked DDOT to further develop the bus lane idea, then return and discuss it in more detail. DDOT will likely meet with ANCs 1A and 1B in January 2019. There was a lot of initial support for bus lanes at the inital June meeting. If the idea remains popular, it could then move to the next stage of design. 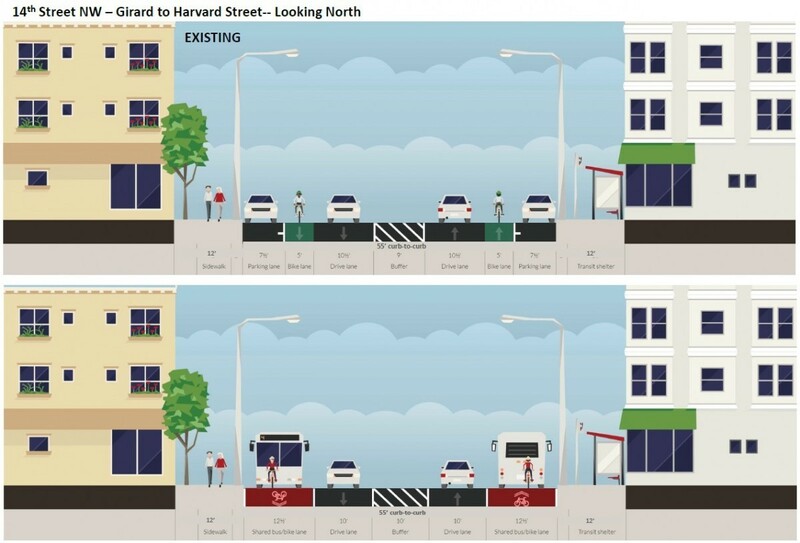 While we are still just at the design and concept stage, it's wonderful to see DDOT proposing progressive solutions to multimodal problems. If implemented, these bus lanes would speed buses on one of DC's busiest lines through one of its slowest chokepoints. If you have questions or comments about this concept (or if you want to share your excitement! ), you can write to the ANCs and DDOT planner Raka Choudhury using the form below.